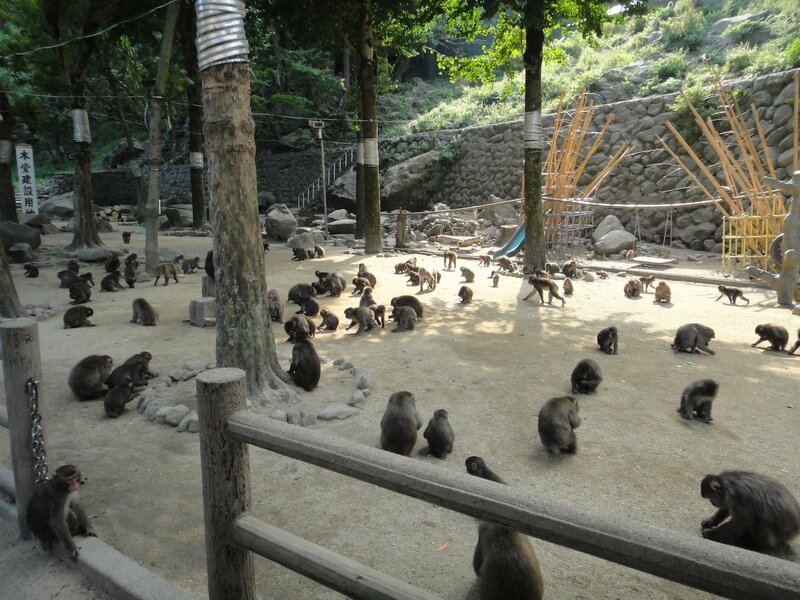 Takasakiyama Natural Zoological Garden is a monkey park near Beppu in Oita Prefecture. It is located across from Umitamago Aquarium. 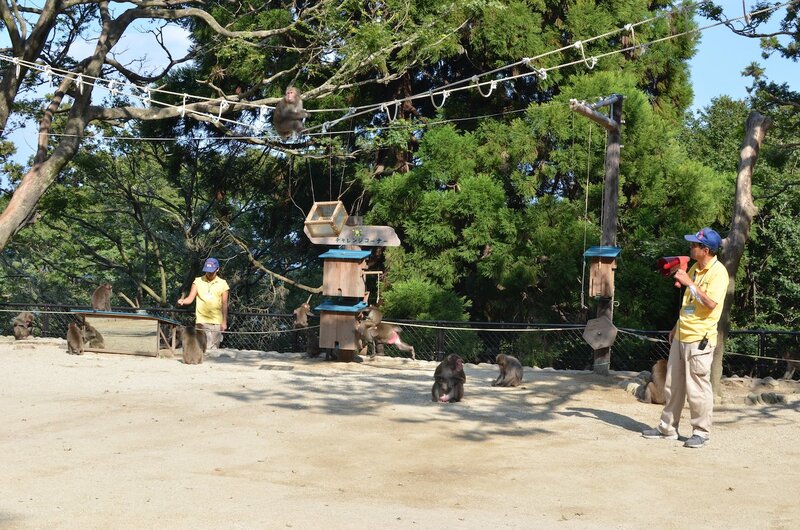 It is run like an open-air zoo exclusively for Japanese macaques (or snow monkeys). The monkeys roam freely. There are no cages or fences separating you from the cute baby monkeys clinging to their moms and the aggressive dominant males charging around. 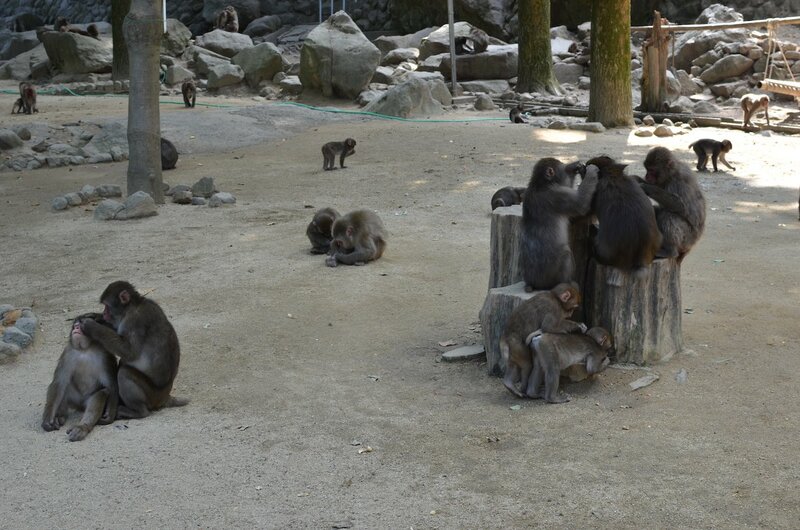 This is the natural territory for Japanese macaques. The monkeys are mentioned living in the area in writing that is 400 years old. 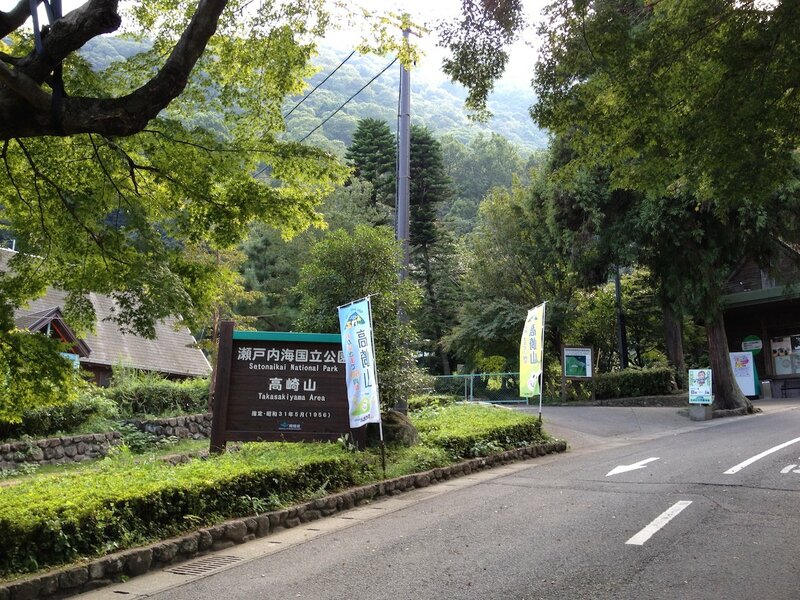 Today, the mountain they live on, Takasakiyama, is part of Setonaikai National Park. 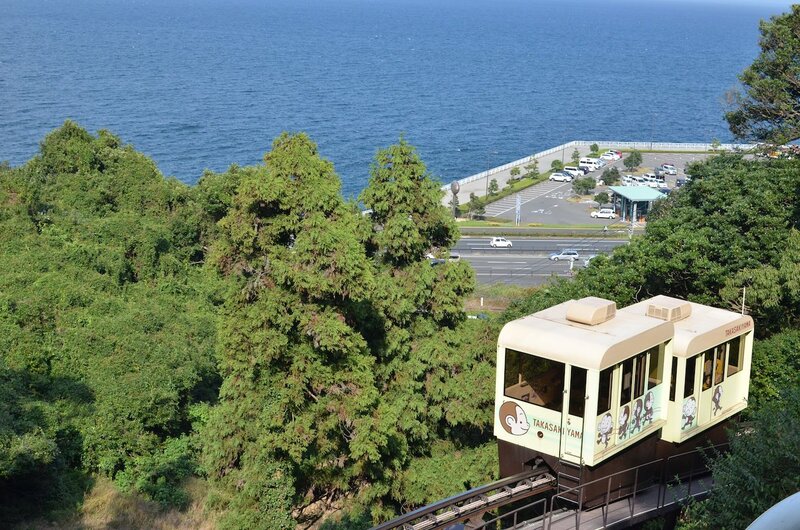 This peak rises to 628 meters directly from the east coast of Kyushu. 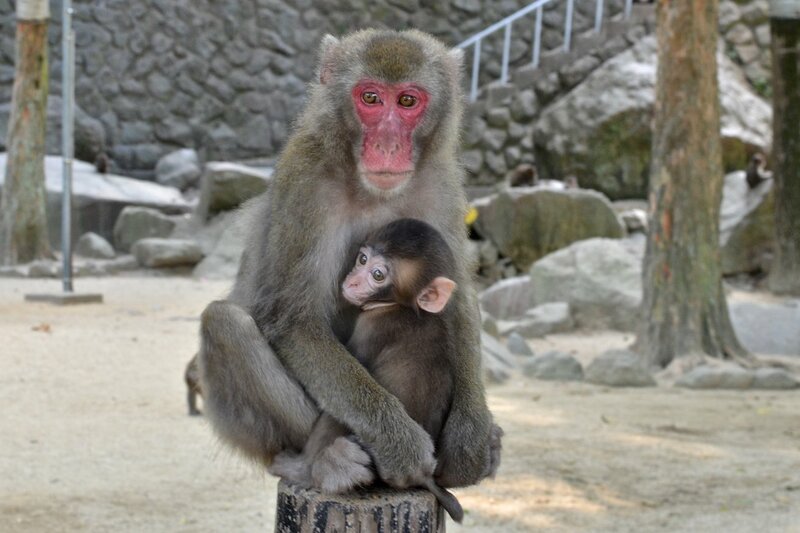 A mother Japanese macaque and her child. The zoo feeds and keeps track of the monkey troops that live on the slopes of the mountain, Takasakiyama (yama means mountain). The monkeys are wild, but many have no fear of people. Normally, there is no danger from them beyond tripping on one that is darting through your legs. Staring directly at one is discouraged to prevent misunderstandings. 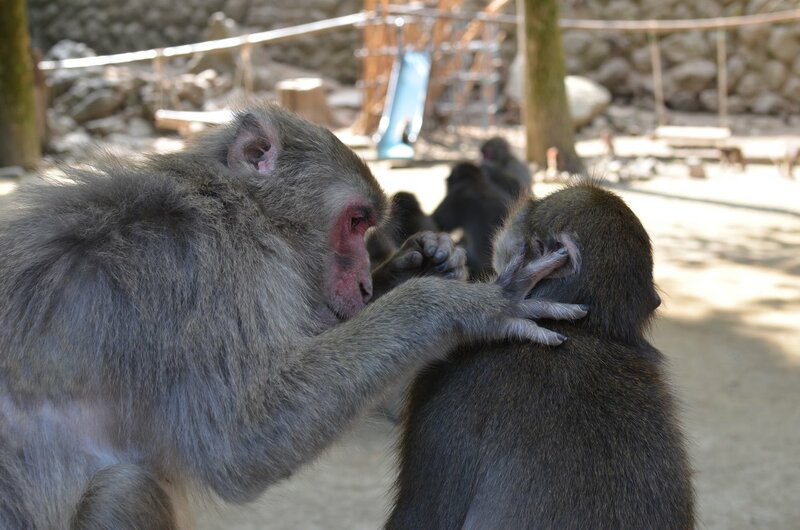 As of 2015, there are around 1,300 monkeys in B and C troop. Troop A vanished in 2002. B and C split off from A in 1959 and 1962, respectively. 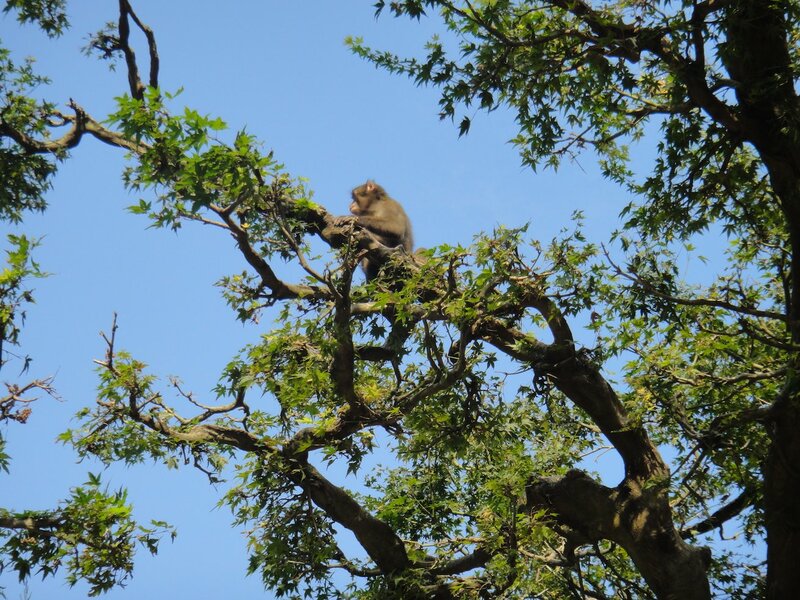 The monkeys in the park live out their lives fairly normally. They groom, grunt, run, play and huddle when cold like they have always done. The exception is that they are fed regularly by the staff who also do talks and demonstrations. 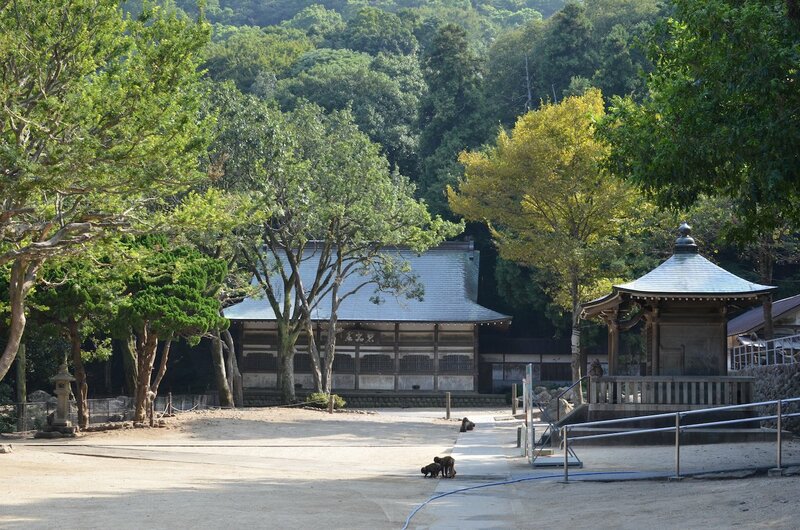 The main area to see the monkeys is the grounds of the Manjuji branch temple. This flat area overlooks the ocean from the mountain. The view is nice and there are two hiking trails the energetic can use to climb up to the park. 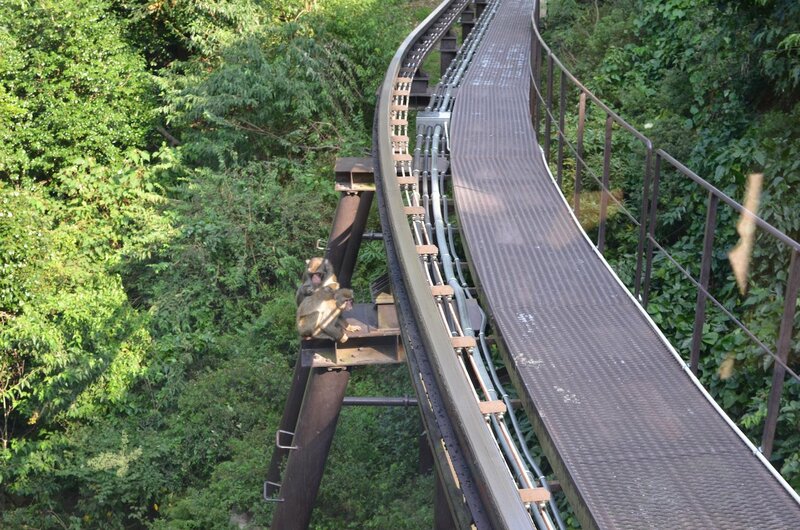 In 2004, a monorail started running up and down the slopes. It takes up to 40 people in 2 cars. The 4 minute ride costs 100 yen. 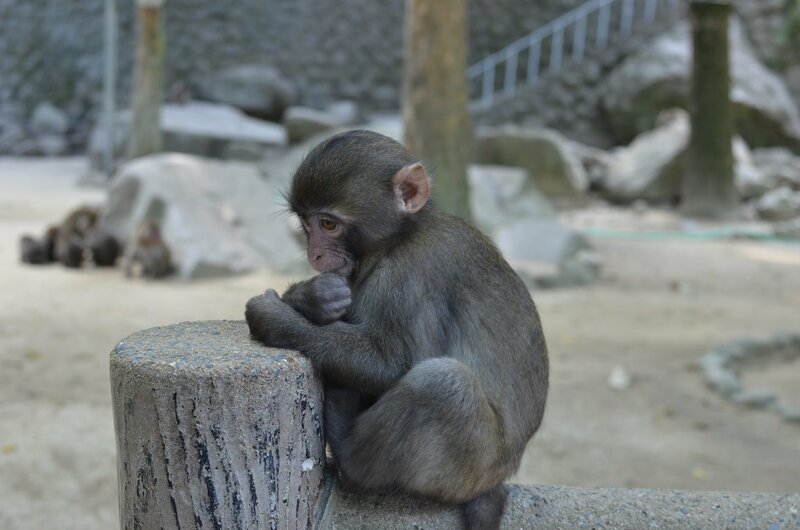 By the end of the Meiji period, there were around 600 monkeys living in the area. A single forest fire in the Taisho period greatly reduced their numbers and there were only 100 in 1940. By the end of the war, the macaque population had recovered to around 200. At some point, the troop established a culture of smash and grab runs on local farms. The pillaging got so bad that the angry farmers responded by looking for ways to hunt and exterminate them. 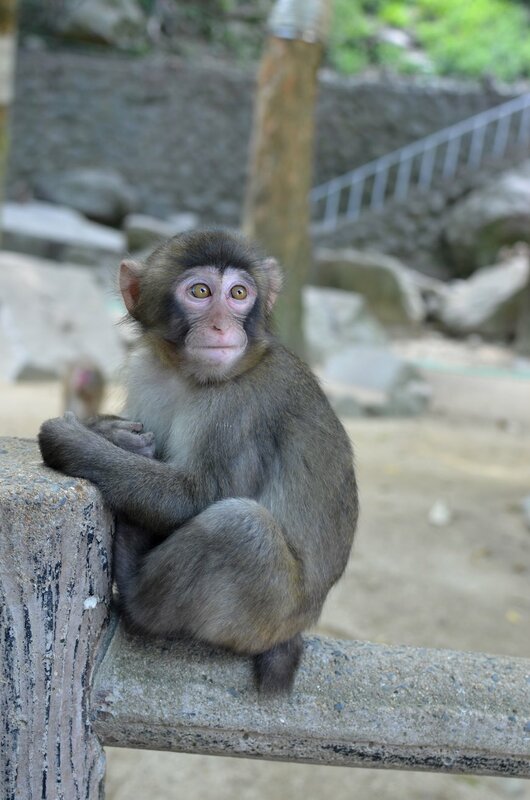 At the end of 1952, the mayor of Oita, Tamotsu Ueda, with the support of the Manjuji branch temple started feeding the monkeys. 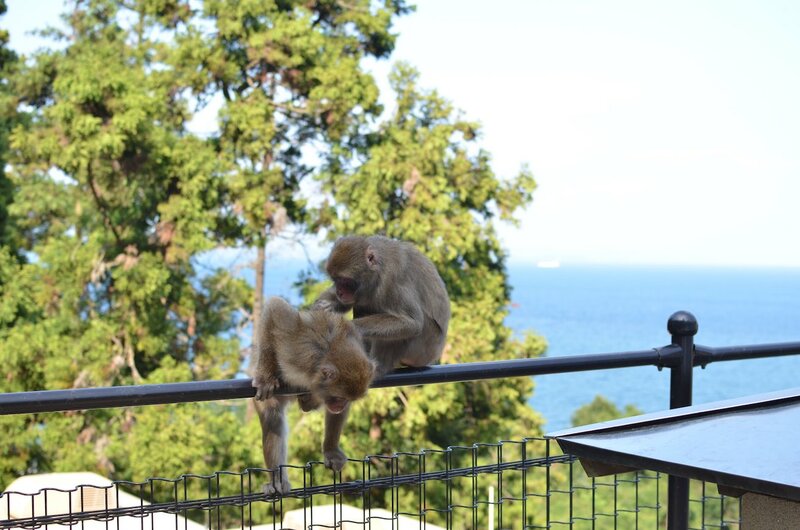 The goal was to habituate the monkeys to people and flip them from nuisance to tourism gold mine. On March 15, 1953, this course forward was formally adopted and the monkey park created. 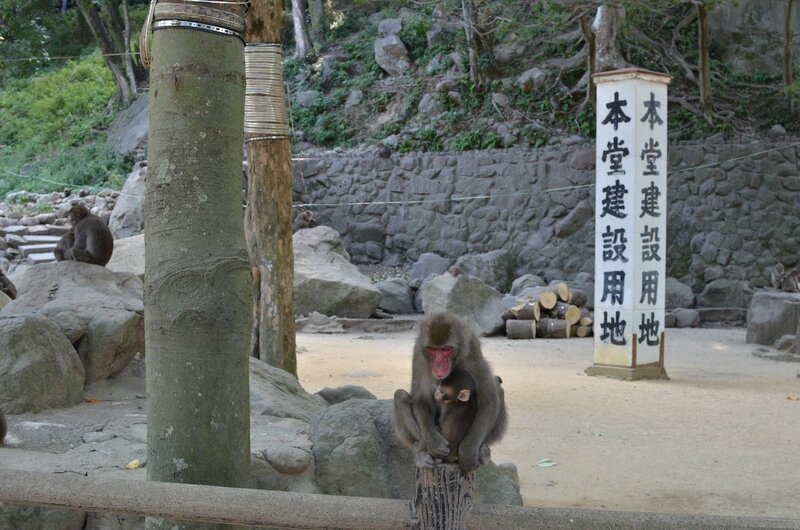 In the same year, the area became part of a park and the monkey habitat was named a natural monument of Japan. In 1954, the temple requested the monkeys move so they could construct a building, but instead an agreement was met to pay for damages and 20% of their expenses. A popular novel was published in 1955 with a location modelled after the zoo. The park became widely known in Japan thanks to the book and its movie adaption. This was where a temple building was to be constructed. 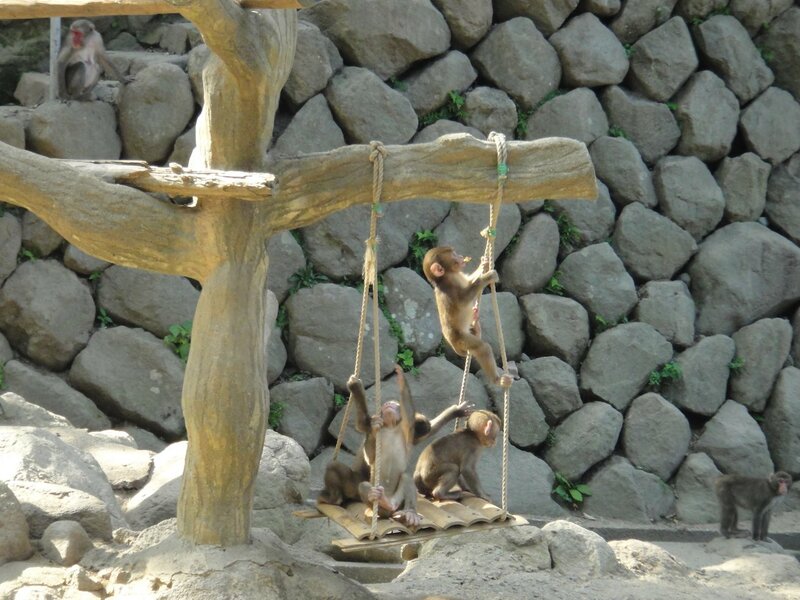 Takasakiyama Monkey Park is located between Beppu City and Oita City on the east coast of Kyushu in Oita Prefecture. Buses from both cities travel from their JR stations along the coastal highway to the monkey park and Umitamago Aquarium. 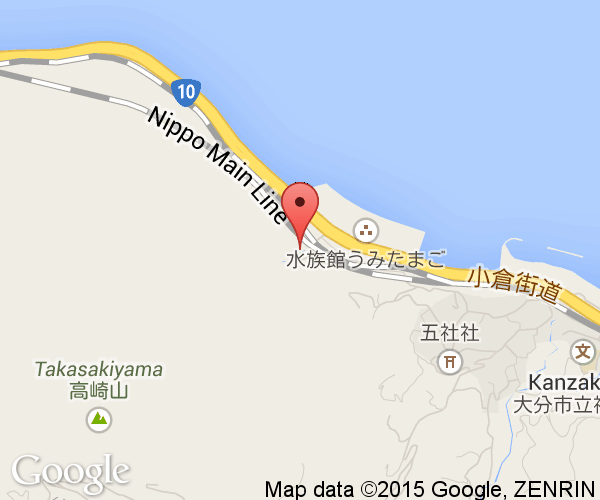 The bus takes around 15 minutes from Beppu and 25 minutes from Oita. There is no train station nearby even though there is a train line between the cities along the coast. Unless you plan on doing an illegal jump from a moving train, you're stuck taking the bus or driving.